In the second chapter of Genesis we find an unfolding of the account of how humankind first sinned and fell short of the glory that God intended. We learn in these verses, and can look upon them as an explanation of why we are all prone to sin. We notice, first of all, that the man had work to do in the Garden of Eden. So it was not all just a stroll down a primrose path. We might wish to think of life in the Garden of Eden as completely carefree. But it seems that having some meaningful work to do is part of God’s original intention for people. We could consider that the work we do each day has built into it God’s intention. We are to work for the betterment of God’s kingdom, we are to work on behalf of Christ to bring about Christ-like goals, and we are to work for mercy and justice as we see Christ working. Later in the Genesis account we will learn that having been expelled from the Garden, people must work by the sweat of their brow to obtain sustenance. But the work in the Garden has a greater focus-to till it and keep it. Then we note that God had provided every tree of the garden for food for people. We might want to think of the variety of fruit trees and nut trees, for a clue at the range of delicious and nutritious food that God made for us. That kind of abundance can be seen when we drive past an orchard. Or when we are in the produce aisles of the grocery store. These are hints of the Garden of Eden. We have God to thank for the abounding goodness of every tree of the garden. Almost immediately thereafter, God cautions the man not to eat of one particular tree. The tree of the knowledge of good and evil. 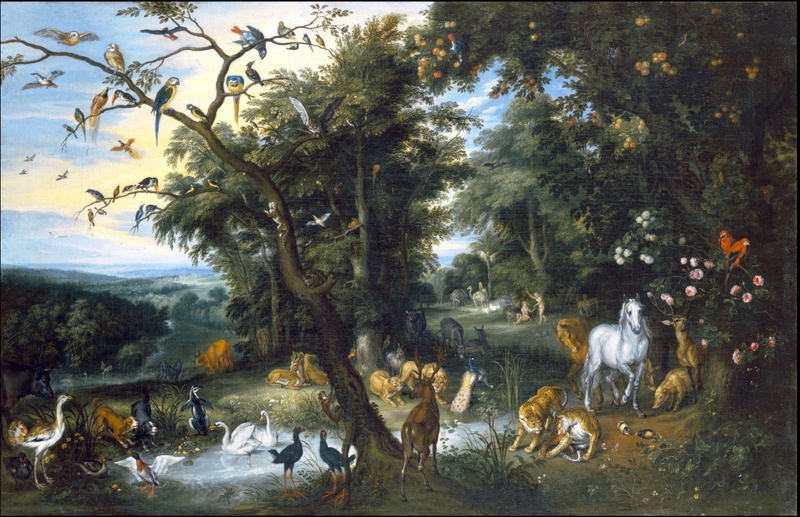 Surely, we think, with all that abundance, Adam can do without that one particular tree. Well, as it turns out, no that is not the case. Curiosity? Rebellion? A false sense of self-reliance? All of the above? Whatever the causes, the man does eat and as a result is subject to mortality. After God had formed Adam, he put him in the garden. All boasting was thereby shut out. Only the God that made us can make us happy; He that is the Former of our bodies, and the Father of our spirits, and none but God, can fully provide for the happiness of both. Even in paradise itself man had to work. None of us were sent into the world to be idle. The God that made our souls and bodies, has given us something to work with; and He that gave us this earth for our habitation, has made us something to work upon. The sons and heirs of heaven, while in this world, have something to do about this earth, which must have its share of their time and thoughts; and if they do it with an eye to God, they as truly serve Him in it, as when they are upon their knees. Observe that the tenant, master of the house is an ancient and honourable calling; it was needed even in paradise. Also, there is true pleasure in the business God calls us to, and employs us in. Adam could not have been happy if he had been idle: it is still God’s law, He that will not work has no right to eat, 2 Thessalonians 3:10. Let us never set up our own will against the holy will of God. There was not only liberty allowed to man, in taking the fruits of paradise, but everlasting life made sure to him upon his obedience. There was a trial appointed of his obedience. By transgression he would forfeit his Maker’s favor, and deserve His displeasure, with all its awful effects; so that he would become liable to pain, disease, and death. Worse than that, he would lose the holy image of God, and all the comfort of his favor; and feel the torment of sinful passions, and the terror of his Maker’s vengeance, which must endure for ever with his never dying soul. The forbidding to eat of the fruit of a particular tree was wisely suited to the state of our first parents. In their state of innocence, and separated from any others, what opportunity or what temptation had they to break any of the ten commandments? The event proves that the whole human race were concerned in the trial and fall of our first parents. To argue against these things is to strive against stubborn facts, as well as Divine revelation; for man is sinful, and shows by his first actions, and his conduct ever afterwards, that he is ready to do evil. He is under the Divine displeasure, exposed to sufferings and death. The Scriptures always speak of man as of this sinful character, and in this miserable state; and these things are true of men in all ages, and of all nations. Why is this true? God blessed us with free will so that we were not trapped as nothing more than inanimate objects in this world. Why do you think God gave man work to do in the Garden of Eden? What happens if people do not have meaningful work to do? How is this a problem in today’s society and world? What does the fact that God supplied every kind of tree suggest to you? What do you think caused the man to eat of the tree of the knowledge of good and evil? Why do you think it was harmful to eat of the tree of the knowledge of good and evil? What does sin do to the relationship between the man and God? 18 John’s disciples told him about all these things. Calling two of them, 19 he sent them to the Lord to ask, “Are you the one who is to come, or should we expect someone else?” 20 When the men came to Jesus, they said, “John the Baptist sent us to you to ask, ‘Are you the one who is to come, or should we expect someone else?’” 21 At that very time Jesus cured many who had diseases, sicknesses and evil spirits, and gave sight to many who were blind. 22 So he replied to the messengers, “Go back and report to John what you have seen and heard: The blind receive sight, the lame walk, those who have leprosy are cleansed, the deaf hear, the dead are raised, and the good news is proclaimed to the poor. Jesus a following and some notoriety. Jesus does not offer a direct answer to John’s disciples. He does not say, Yes I am the Messiah, nor does he say that he is not the Messiah. He leaves it up to them. He does this with every person who comes to ask. There are clues, and Jesus outlines some of them in this passage. The clues he gives are ones that have to do with miracles of healing, as well as the bringing of good news to the poor. Miracle healers have existed in every age. So while such things are exceptional and make the healer stand out; that is not the whole story. We mayor may not know of people who’ve raised the dead. This is more exceptional by far; and yet is not the whole story. Jesus adds, lithe poor have good news brought to them.” Some think that John sent this inquiry for his own satisfaction. Where there is true faith, yet there may be a mixture of unbelief. The remaining unbelief of good men may sometimes, in an hour of temptation; call in question the most important truths. But we hope that John’s faith did not fail in this matter, even though he was in prison; and that he only desired to have it strengthened and confirmed. Others think that John sent his disciples to Christ for their own satisfaction. Christ points them to what they heard and saw. Christ’s gracious compassions to the poor, show that it was he that should bring to the world the tender mercies of our God. And untimely they must decide for themselves, as must every person. Verses 18-20 Some of John’s disciples had seen the things that Jesus had done. They had seen that Jesus had cured many people. And they saw when Jesus raised the widow’s son from death. They went and they told John about Jesus. So, John sent two of them to Jesus to find out if Jesus was the Christ. It seems strange that John should ask this question. He had baptised Jesus. The voice from heaven said that Jesus was the Son of God (Matthew 3:16-17, Mark 1:11). John knew that Jesus would baptise with the Holy Spirit and fire (Matthew 3:11, Luke 3:16). John told some of his disciples that Jesus was the Lamb of God. And he told them that Jesus would take away the sin of the world (John 1:29). For some reason John needed further proof that Jesus was the Christ. Soon after John had baptised Jesus, Herod put John in prison. So, John could not have seen Jesus as he did these miracles. He could not have heard Jesus as he taught. In the prison, perhaps John began to doubt that Jesus was the Christ. Perhaps John started to think that Jesus was just another prophet. Perhaps the Christ had not really come yet. Perhaps Jesus did not do what John expected the Christ to do. However, it is possible that John did not have these doubts. Perhaps John was using this question to show his disciples that Jesus was the Christ. They had remained loyal to John, but John was not trying to get disciples for himself. His constant desire was to introduce people to Christ (John 3:26-30). Verses 21-22 Even in the day that John’s disciples came, Jesus had cured many people. He had made people free from evil spirits. And he had given sight to people who were blind. So, Jesus sent his answer back to John. He told John’s disciples to tell John what they had seen. And he told them to tell John what they had heard. Then Jesus told them some of those things. All these things proved that Jesus was the Christ (Isaiah 35:5-6, Isaiah 61:1: Luke 4:18-21). Those who accept this, God will bless. John and Jesus were cousins. They knew each other from infancy. Why do you think John had questions about Jesus at this late date? What happens to a person’s thoughts, when they are in prison? John’s followers asked the question in a somewhat indirect manner-they did not come out and say directly, “Are you the Messiah?”. Why? Jesus gave a list of mighty acts to point to who He is. Which of these stand out the most for you? Do you think that the followers of John the Baptist”got the point”? There are people we will meet every day that question whether Jesus is the Messiah. What do we tell them? What do we show them?